Click the button below to add the Smoked Ham, Sugar Cured to your wish list. Impress all your guests at your next holiday feast with our delicious and beautiful Smoked Sugar Cured Hams. We also offer Center Sliced Smoke Cured Hams and Smoked Spiral Hams. Our Smoked Meats are slow smoked over a hickory wood burning fire. 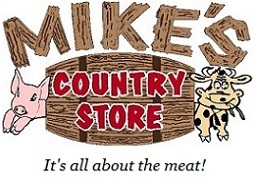 At Mikes-Country-Store.com, our Smoked meats are hand-trimmed using USDA inspected grain-fed pork. Place your order today! We sell Smoked Applewood Bacon, Sausage, and Sausage Patties too!. We even have Beef Jerky! We also have specialty items to compliment your meat, such as our rubs and sauces. Beef, Pork or Chicken, we sell beautiful fresh, smoked, and pre-cooked meats that are sure to impress your guests.